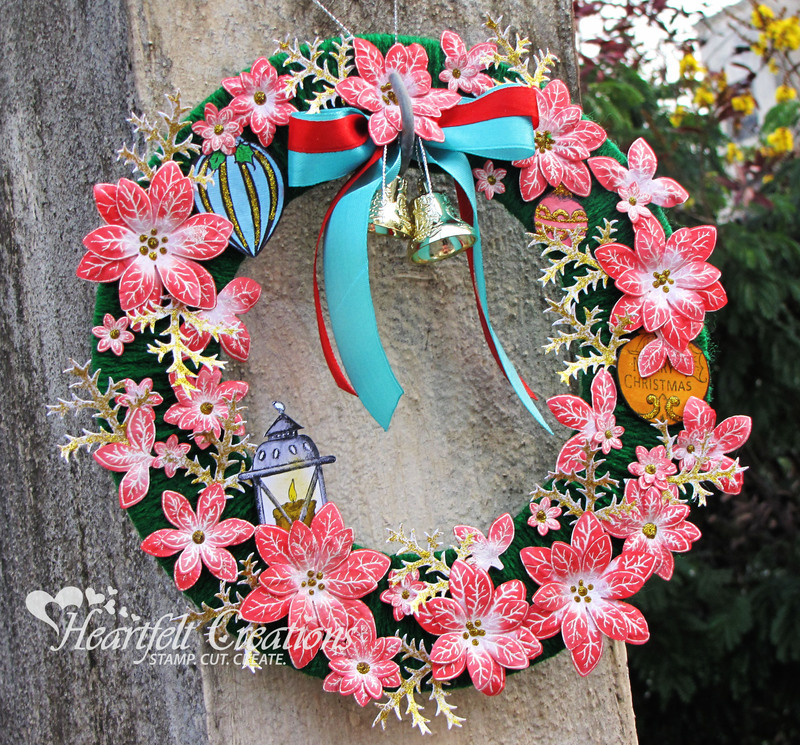 Heartfelt Creations Alumni December Blog Hop! Each month some of the alumni design team members get together and participate in this hop and I'm so happy to get to play along. If you arrived here from Caroline Duncan's blog you are right on track. Remember to leave a comment on as many of our blogs as you can to be in the running to win a $25 gift certificate from Heartfelt Creations. My design team term for Heartfelt Creations is coming to an end today. It has been such a tremendous year being on the team and working with such wonderful people and gorgeous products. I am really gonna miss it all. Here is some more inspiration from this Month's Heartfelt Creations release! It's been quite a while since I shared my fun little CAS cards here on the blog but I have been making a lot of them. I have build up the sentiment with a mix of stamp and stickers(and my handwriting :)). The uber cute bananas are from Lawn Fawn, of course :), stamped, colored, fussy cut and popped up with foam dots. I love this happy card. How about you? Heartfelt Creations October Release - All Geared Up Collection! With an ill baby and then a ill me and a ill husband, I didn't get together a new creation for this week for Heartfelt Creations. So I thought I will share an old project which I didn't get the opportunity to share here on the blog. Project Instructions: Other Products: Tombow Multi Mono Glue, Distress Inks (Tattered Rose, Bundled Sage), Golden glitter, Creative Embellishment laser cut embellishments (Ornate frames, Autumn leaves). Instructions: Start with a 5.5" X 5.5" folded card base. Cut a pattern paper from the Classic Sunflower Collection. Stamp the image from the Sunflower Bouquet PreCut Set twice on the pattern paper. Colour the stamped image using distress inks. Stamp the background image using the Classic Sunflower PreCut Set on cream card stock and die cut the flowers using Classic Sunflower die. Colour the die cut flowers using distress inks and mold them to shape. Add glitter for the centre. Make a sentiment banner and arrange everything as shown. Don't forget to visit the HC blog for tons of inspiration!